Leading Manufacturer of nmp extraction plant from Pune. NMP Extraction: We hold expertise in offering NMP Extraction process to our valuable customers. This is our indigenously developed technology by continuous R&D. The distilled oil from either WFE or Vacuum distillation has to be polished to improve the viscosity index, Colour, Oxidation stability. The cleanest method of doing the same is extracting the distilled oil by NMP solvent and then separating and distilling the solvent from the oil and from the extract for reuse, the final traces of NMP in the oil and extract are removed by stripping. 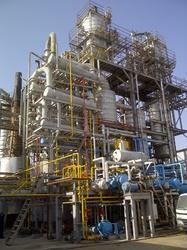 The solvent extraction technology is the most preferred method of polishing for big capacity plants exceeding 1000LPH. This process is designed and supplied in both continuous and semi continuous manner depending upon the capacity of the plant. This process does not produce any solid waste, the solvent is recycled back and the extract left behind is used as fuel in the plant itself. Looking for NMP Extraction Plants ?